Look for showers and thunderstorms to remain in the forecast over the next several days as another slow moving warm front crosses the region. Temperatures will respond by rising as well. Today and Tonight: A warm front will work north through the region instigating a few showers and thunderstorms as well as higher temperatures. Expect highs in the mid 70s with a more humid feel as well. Fog may return as a nuisance overnight with mostly cloudy skies otherwise and lows in the mid 60s. Up Next: A stronger upper level disturbances should heighten rain coverage again on Thursday followed by a downturn on Friday. Both days, high temperatures will warm into the mid and upper 70s. A cold front will move in by the weekend. 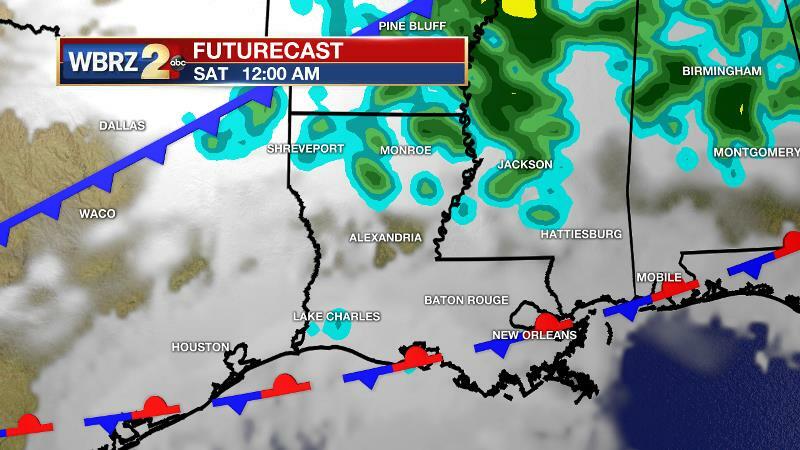 Models are still inconsistent with the timing of the cold front, but the current forecast calls for a Saturday passage. The early indication is that the front will slow and allow clouds and showers to linger on Sunday and possibly Monday. Cooler than average temperatures will follow. Readings may be 10-15 degrees below average for Lundi Gras and Mardi Gras. 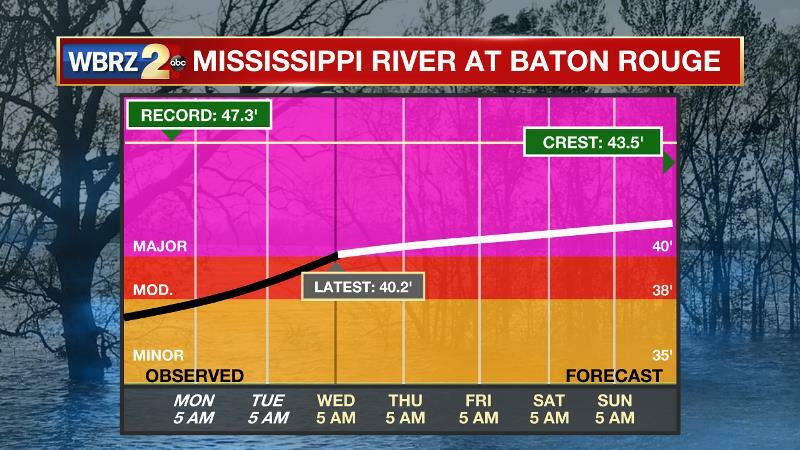 The Mississippi River: Major flood stage has been reached in Baton Rouge with a level of 40.5’ as of Wednesday morning. Though the classification of “major flood stage” sounds scary, impacts to land are minimal thanks to levee protection. The high water is primarily an issue for river traffic and river islands as well as a few spots north and south of Baton Rouge that will turn soggy along the banks. At this time, the river is projected to crest by late March at a level similar to what was reached last year around 44’. The threat for any strong or severe thunderstorms is quite low through the end of the week, despite an active pattern staying in place. Rain should be in waves as weak disturbances move over the area for the next several days. Timing is tricky on additional disturbances, but the next most likely time for increased action is on Thursday. Either way, isolated to scattered showers and thunderstorms will stay in the forecast through Friday. The advance of a warm front means well above average temperatures can be expected. Warmth and moisture may create some morning fog as well. A cold front will move through this weekend. This front could be in the form of a dual wave with the first moving to the coast and stalling Friday evening. This feature is quite subtle though. The second, more significant front will then move in around Saturday night. An active subtropical jet stream will keep moisture flowing across these boundaries and therefore rain showers will stay in the forecast despite a frontal passage. While this is a tougher aspect to the forecast, models are in agreement that temperatures will dip well below average early next week.